This mini-howto is based on my personal experience flying this beautiful plane (sadly, only in FlightGear, never in real life...). Please feel free to add content or correct whatever you think is wrong. Turn on the battery switch and both alternators. The switches are the first 3 from the left of the panel. Start the engines turning the engine switches to the right (press ctrl-c to see the hotspots), and keep them pressed until the engine start. If starting with a button on the joystick, switch to "Both" mags on the starter switches first. 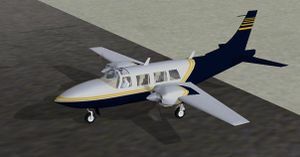 Because of the small wing area of the Aerostar, it's not recommended to take off without flaps. The airplane will seem to roll forever! Flaps: 20° (2nd notch) or 30° (3rd notch), depending on field length. Rotate: 80-100 kts depending on flaps settings. Let the aircraft accelerate past 140 kts before retracting flaps. With full throttle and propeller, a climb rate of 2000+ fpm can be attained. Due to the small wing area and the high speed of this airplane, early speed reduction is a must. Slowly, reduce throttle to (almost)idle and pitch up to reduce speed without loosing too much altitude. Around 190 kts, start applying flaps (up to the 3rd notch). Try to keep a descent rate of 1500~2000 fps and speed around 150 kts. 140 kts at downwind, leveled, flaps at 30° (3rd notch), mixture rich and propeller at full RPM. Apply full flaps, and reach base with 125 kts before turn. Reduce power and pitch up to reach final at 110 kts. Touch down at 90~100 kts. On a longer strip, you could do a similar procedure without applying full flaps (ie: at 30°), reaching final arround 130 kts, and touch down at 120kts.